I’m still struggling to find a favorite preparation for Bomster scallops – nearly every preparation I’ve tried since we moved up here has been less than satisfactory, and a real disservice to these super-fresh beauties. What I did last night hit closest to the mark, though it still needs some tweaking. The chowder-like base was a hit and the texture of the scallops was perfect, but I would have liked the scallops themselves to have a bit more oomph in the flavor department. This is one of those rare occasions when I actually measured and took notes while I prepped and cooked. Here’s what I did – maybe one of you has a suggestion about how to tweak this? Place the bacon in a small, dry saute pan. Cook over medium heat until crisp, set the bits on a paper towel to drain and set aside. Remove most of the fat from the pan, but leave a film in the pan to sear the scallops. Melt butter in a wide saucepan. Add the leeks and celery, season with salt, and cook until softened. Add the potato, a pinch more salt, freshly ground pepper, and marjoram, and stir until the vegetables are coated with the butter and seasonings. Sprinkle the flour over and stir until vegetables are coated; allow to cook for a few minutes until you no longer have a raw flour smell. Add the white wine and stir well, cooking until reduced and thickened. Add the milk and stir through. Cover and cook until the potatoes are tender and the liquid is thick and creamy. Add the corn a few minutes before serving, just to warm it through. When the chowder is almost finished, sear the scallops in batches in the reserved bacon fat, a couple of minutes per side, until they get lightly caramelized and they are just cooked through. To plate, ladle the chowder mixture into wide, shallow bowls, top with a few cooked scallops, and garnish with crispy bacon and finely chopped celery leaves. The recipe looks and sounds wonderful! Have you ever tried soaking them in a bit of milk or buttermilk before you sear them? –sprinkle the greased pan first with a mix of ground chipotle chili or paprika and black pepper (plus a little cumin if appropriate for the recipe), then put the scallops on top of that. As the scallops sear, the spices form a tasty crust. –after the scallops are done, add a little crushed garlic and then almost immediately deglaze the pan with a splash of balsamic vinegar, and pour this over the scallops on the plate, or just toss the scallops back into the pan and swirl them around for a moment to coat them. 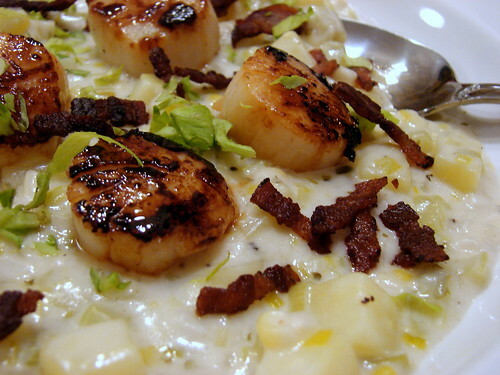 I’ve never thought of serving scallops over chowder, but it looks fantastic. I think the spice-crust idea might go well with this, and I think the spicy/garlicky/tangy dribble of deglazed pan juices over the top might work well too, in a slightly bizarre way. If you try it, I look forward to reading how it goes! I introduced my mother to your blog (it was the posting about the dulse that prompted me) and the next night she made the dulse and mahogany rice dish. Such beautiful food! Thank you as always. I don’t have any suggestions – I just wanted to say that that looks absolutely delicious! my first thought was saffron, perhaps added into the spice mix that julia f. described. I love scallops with a balsamic glaze, as Julia F. says… but also with miso. Of course, the miso with chowder may not be the best combination. Miso glazed scallops with bok choy…. mmmmm.. okay, I’ve gone AWOL from this post. Also just wanted to say I love your blog and thank you for giving us this little daily/weekly pleasure. Thanks for all of your comments and suggestions, everyone! I agree that a punchier seasoning mix would help – when we lived in Brooklyn and got wild dry Montauk Dayboat scallops, I often seasoned them with a little homemade chile powder and lime before searing or grilling, and that worked well. I wonder if something like a smoked paprika would work for this particular preparation? It might complement the corn and bacon in the chowder, while also giving the scallops a little more spice. Something to ponder, for sure. It was with glee that I saw these on the top of the page today, and with dismay that you aren’t finding the flavor in these beautiful jewels. My only suggestion, which may seem obvious, is to put them in the hot pan almost dry. After I rinse them, I roll them in a kitchen towel to remove as much moisture as possible, that way they don’t steam themselves. My husband used to work on one of the Bomster’s boats and they would shuck them and eat them like oysters. You’ll never find a better product. 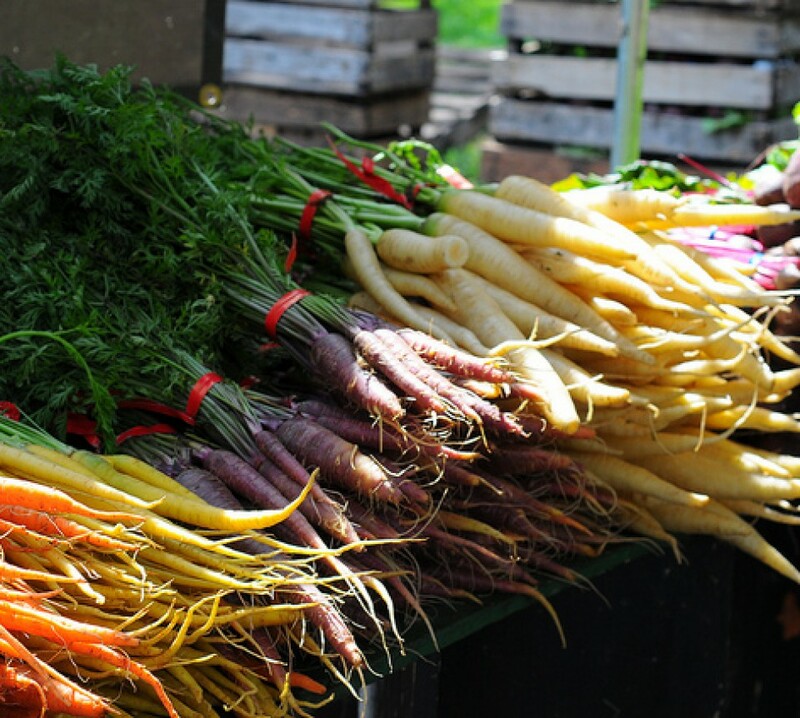 If you come to the Stonington Farmer’s Market in the summer, their retail spot is right next door and they are always offering up samples, i.e. ceviche which I had last summer, and I’m sure they could give you a few pointers as well. They are spectacular people. After I thawed these, I dried them well with paper towels to remove excess moisture before putting them in the pan to sear, and I made sure not to crowd the pan so they wouldn’t steam, so I think my main thing is going to be preparing them with punchier seasonings. They are *so* creamy and delicate, I think this particular dish didn’t really show them off to the fullest. Poach some onions until traslucent in olive oil(do not caramelize! ), add a bit of thinly sliced cured ham (serrano, iberic if you can get some, prosciutto would be borderline heretical, but… chorizo and bacon works in a slightly different way). Clean scallops and place them on their own shells, salt with kosher, put some of the onion mix over it, put in the oven until the meat’s white (but careful with overdoing them, they should be juicy and almost raw), eat straight off the shells. Long time reader, first time poster here (and very excited about this). 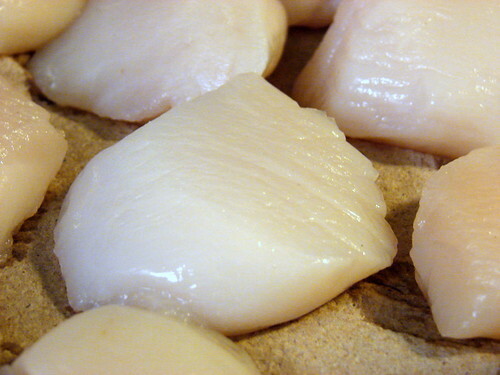 What I do with scallops — qtr them, add equal amounts sea bass and ceviche the hell outta them! Perfect for summertime entertaining.